After creating your character file (.gcha) from your custom character, you will want to create Golaem Motion Files (.gmo) from your animations. First of all, it may be useful to check if your motion fills the Motion Prerequisites. 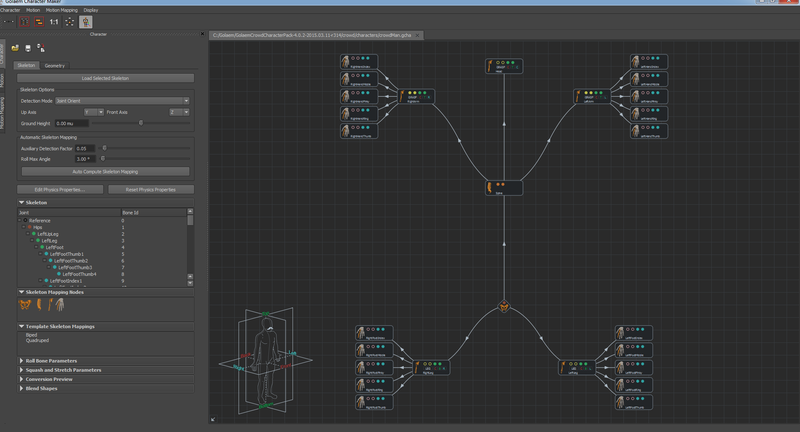 Import your animation in Maya. Open the Character Maker . First you need to load ( ) a character to import the motion on. If the animation is done exactly on the same character that you used to create your character file, you can just load this character file (.gcha). Otherwise (e.g. if your motion is from a mocap skeleton), you need to create a character file for this particular skeleton to be able to import its animation (see the previous tutorial). You will then need to create a motion mapping file (.gmm) to retarget the created motion to the character you want to use in your simulation. 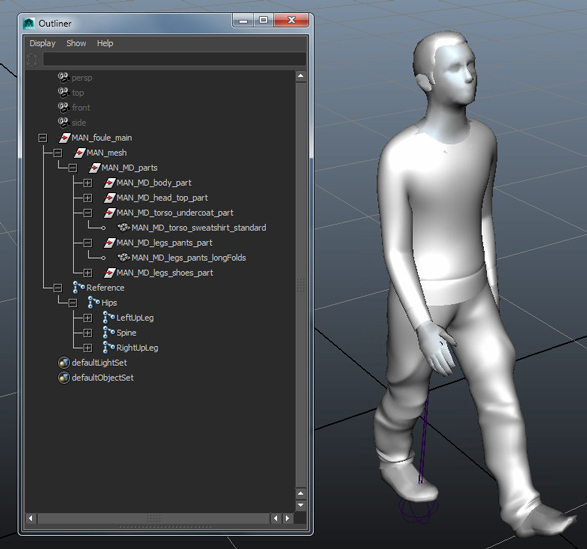 Make sure that the loaded character is using the same skeleton as the animation to import from Maya. When trying to import looping motions, make sure the first frame and last frame are playing the same posture (but eventually with a different global position/orientation). This is because the last frame will be skipped and the first frame will be played instead when playing the animation in loop with a Motion Behavior or a Locomotion Behavior. This is irrelevant if the motion is not intended to be used in loop mode. Next go to the Motion Tab. Select the root of the character, and click on the Load Motion From Selection button. You can see that the Character Maker Locator now plays your animation. If both Forward Cinematic Animation Compatibility and Golaem Conversion Quality are green, and the Character Maker Locator closely follows your animation when you play it, you can proceed to the next step. Otherwise, see the explanation about their meaning. a wrong skeleton mapping (not enough degrees of freedom for the desired animation). This means that one joint that has an animation is not used in the skeleton mapping, and the same animation can not be done with the given Character file. See how to build a correct Character File. At this point, you can crop your motion, or edit it or make it loop. If the animation is to be used in a Locomotion Behavior, it is advised to make sure it is looping perfectly. The Character Maker Locator has an option to play the motion in loop to ensure it's working correctly. Note that if you have a lot of motions to export and want to create a script for it, you can use the glmExportMotion command.